From the moment you land at Entebbe´s modern and efficient international airport, with its breathtaking equatorial location on the forested shore of island-strewn Lake Victoria, it is clear that Uganda is no ordinary safari destination. Uganda´s star attraction is the endangered mountain gorilla, the bulkiest of all living primates, and among the most peaceable. Other highlights in Uganda are the world-class whitewater rafting at the source of Nile River, and some of the region´s more peaceful national parks, where wildlife viewing doesn´t involve long waits in line behind a dozen or more vehicles. Uganda can be visited throughout the entire year, as it enjoys the perfect tropical climate. The average temperatures are about 26°C during the day and 16°C at night. From December to February the temperatures are the highest. Queen Elizabeth National Park is one of Uganda’s most beautiful parks, featuring activities such as the launch on the riverboat, tree-climbing lions, superb scenery and more. Murchison Falls National Park is Uganda’s largest National Park and full of beautiful scenery, the highlight of which is the stunning Murchison Falls, where the whole might of the White Nile River is squeezed through 10metre gap and plunges 45m into a pool below. The Rwenzori Mountains, formed about three million years ago and named the Mountains of the Moon by Ptolemy in AD 150, is a famous spot for mountaineering safaris, treks and hiking. Lake Bunyonyi (“place of many little birds”) is said to be the second deepest lake in Africa. Bwindi Impenetrable Forest is one of the most biologically diverse areas in the world. 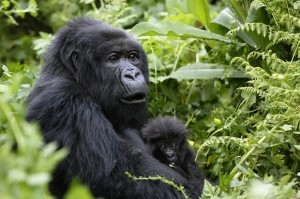 Half of the world’s population of Mountain Gorilla live here. To visit these incredible creatures is a treat for humans and a once in a lifetime experience. The second busiest commercial centre in Uganda, Jinja presents visitors with a range of sporting activities including white-water rafting and sailing. This funky old town, with is Art Deco buildings is home to the legendary “Source of the White Nile River” and is the base for outfits offering world class rafting trips. World-class white-water rafting is offered at the source of the Nile River. Close by is the capital, Kampala, on the shores of Lake Victoria, is a bustling city with small town charm. Lots of fun to visit for a day or two of shopping and exploring. Let us know how much time you have, what areas interest you and our expert travel consultants will recommend the best fit for your safari. We will put together a tailor-made Uganda journey to suit your budget and time requirements. We will also pass on any value-adds possible, such as free nights, free flights and other discounts. Africa Bespoke offers journeys to hand-picked independent camps throughout Uganda.